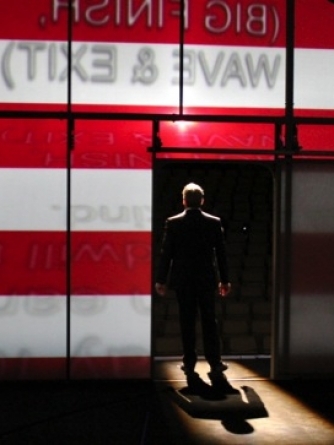 Our Assistant Stage Manager for The Speechmaker, Stephen Moore, gives us a very special look behind the scenes on Air Force One. Air Force One, the iconic aircraft which whisks the President of the United States around the world, operates thanks to a multitude of crew: from the hand-picked pilots and the aircraft’s engineers through to the onboard chefs and dedicated cabin crew. And just like the real Air Force One it takes a legion of personnel to get The Speechmaker off the ground each night. First up is our ‘Captain’: Stage Manager Christine Bennett. It’s Christine’s role to oversee and command the stage. For each performance she does countless pre-flight checks making sure everything is as it should be. She handles the safety of those on board and liaises with our ‘ground crew’ back at MTC Headquarters. When something goes awry (and lets face it, it’s live theatre: there’s always something happening) Christine is the decision maker and she steers us back on track. 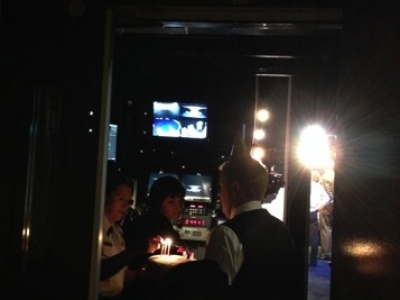 Stage Manager Christine Bennett lights the candles on the prop birthday cake, held by Brent Hill, as Deputy Stage Manager Julia Smith watches on. 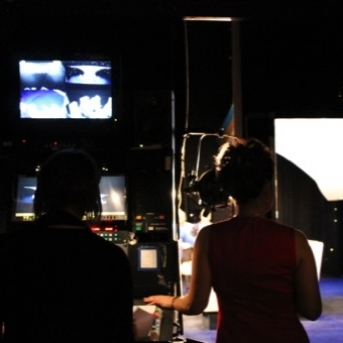 Christine also oversees the teleconference sequence with the Prime Minister of Great Britain, who is filmed live each night in a special booth backstage. 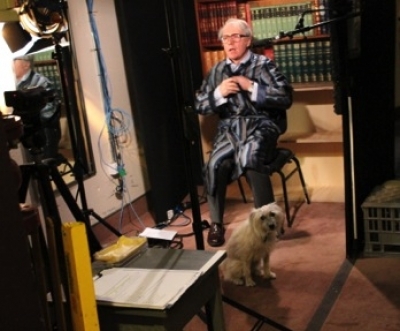 Nicholas Bell, who plays both Bob and the Prime Minister, has 30 seconds to run off stage, remove one wig, change costume, put on a different wig and get into position for the live-cross. Nicholas Bell in position as the Prime Minister of Great Britain with a special guest star. 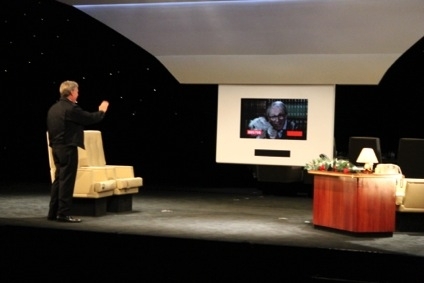 Erik Thomson and Nicholas Bell in a scene utilising a live teleconference cross. If Christine is our captain then Julia Smith, our Deputy Stage Manager, has to be Air Traffic Control. Just like an Air Traffic Controller who juggles and coordinates all the different movements at an airport, Julia coordinates all the technical elements of the show. From her position in Prompt Corner she keeps a watchful eye over everything that’s happening. Across multiple screens Julia has access to an assortment of camera angles—some tightly focused on specific areas, some overhead, some for low-light situations and others for general use—which allow her to monitor every corner of the stage. At the same time as personally operating all sound and AV cues, Julia ‘calls’ the show, giving verbal “Go” cues over radio headsets to the Lighting Operator, Automation Operator and Flymen, meaning that nothing moves or changes onstage without Julia cuing it. And if all this wasn’t enough, she also follows the script word for word noting audience reactions, any slight variations in the script and paging the cast to the stage when it’s time for their entrance. Silhouetted against the bank of TV screens which allow them to see the action on stage, Sherdian Harbridge waits for her entrance next to Deputy Stage Manager Julia Smith. The title of ‘Navigation Officer’ would have to go to our Automation Operator, Nick Wollan. From his sidestage perch, Nick is able to see the action directly through a special one-way gauze fabric screen. In addition to this he has a bank of screens showing a close up view of several points on stage for additional safety. On Julia’s cue, Nick triggers the electric motor hidden beneath the stage floor which controls the speed, direction, acceleration and deceleration of the set’s revolving floor, re-positioning the set to match the action. Responsible for making the aircraft really fly are, as logic would have it, our Flymen. Unlike MTC’s home theatre The Sumner, which uses a state-of-the-art automated fly system, the Playhouse uses a more traditional manual counter-weight fly system. 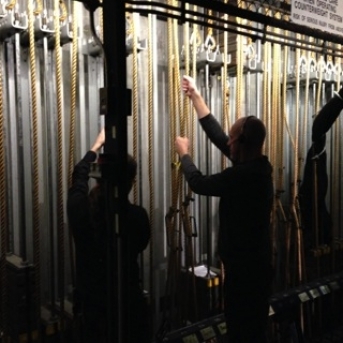 This series of ropes and weights is operated by two Flymen each night who physically haul the set pieces up and down as required; an action known in theatre as flying. 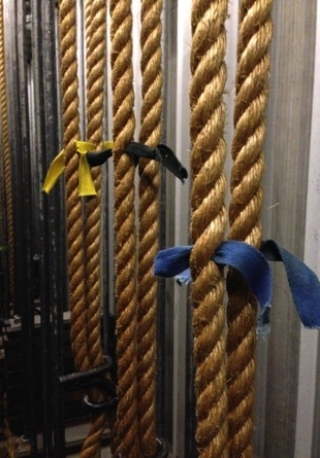 Small coloured fabric strips entwined in the ropes act as markers to indicate where a set piece should stop in order to be in the right position on stage. 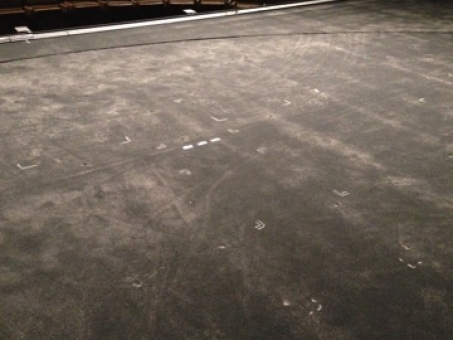 The Flymen use these marks to ensure that the set pieces fly in to the right height. Above and beyond a normal commercial aircraft, the real Air Force One has countless special features and technical additions, including 19 televisions, 85 telephones and twice as much cabling as a regular 747 aircraft. Not to be outdone, MTC’s Air Force One has a myriad of cables running everywhere you look, and we have several technicians constantly monitoring and operating our extensive electronics. 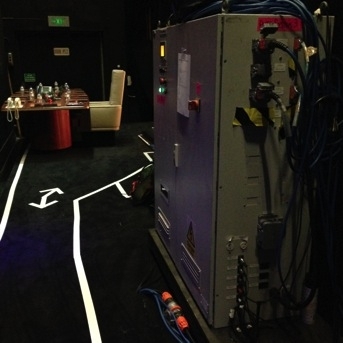 Some of the extensive electronics backstage, with the conference table set tucked away in its off stage storage position. The white lines show the cast where it is safe to walk. 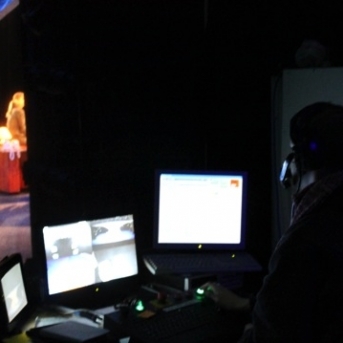 One technician oversees our lights while another two monitor our communications both on stage (each cast member wears a radio microphone) and backstage (all the crew are linked together with wireless headsets in order to keep in communication). In addition, the cast make use of over a dozen functioning handheld electronic devices such as iPads, iPhones, Blackberry phones and Macbooks, during the course of the show. The sound desk at the back of the auditorium, looking down towards the stage. There is no doubt that Air Force One is an extraordinary plane, but the aircraft is as much a flying backdrop for press events as it is a practical mode of transporting VIPs. And while those VIPs no doubt receive little style touch-ups on board to ensure they look perfect when they arrive at their destination, so too our cast receive a little help from wigs and costumes. We have a dedicated costume mistress who ensures each and every costume is pristine and our wig mistress, Jurga Celikiene, has not only hand woven the many wigs used on stage but also helps style each cast member’s hair to ensure that polished look. 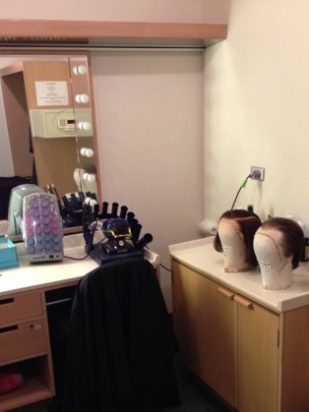 Our Wig room backstage, with some of the wigs waiting for the cast. And then there’s me. 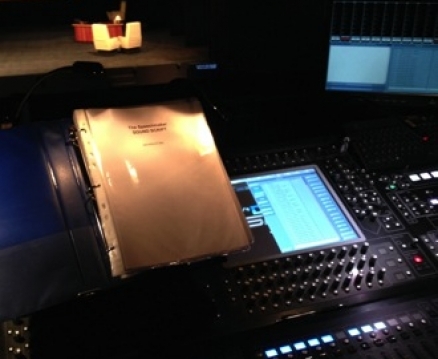 As the Assistant Stage Manager I guess my role would be best described as the cabin crew. Prior to take-off I prepare the ‘cabin’, setting all the props and furniture in their designated places and ensuring elements such as the spike marks (the discrete marks on stage which we use to position furniture during scene changes) haven’t been damaged from the previous performance. This series of dots and lines is how we ensure the furniture is in the correct position for all the various configurations. Throughout the flight it’s my job to make sure everyone on board has what they need: I keep track of the props entering and exiting and make sure that they’re moved backstage to where they’re needed next. In an average show I walk over 3000 steps (around 2.5km). 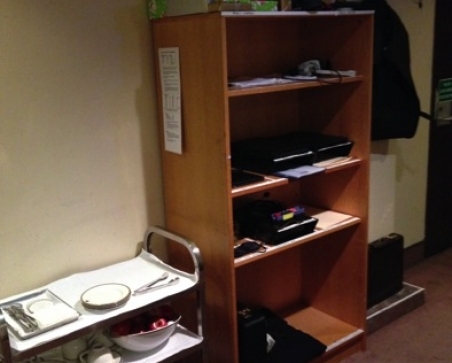 With the set taking up so much space on stage we’re very limited with the amount of room available to us backstage, so instead of traditional long props tables (where all the props are laid out in designated, marked spots for the cast to find) we use bookshelves to store everything. 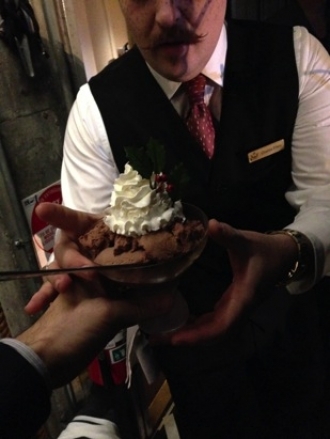 Each Presidential sundae is presented in a glass with a special MTC Presidential Seal. Of course, just like a real aircraft, there is an abundance of ground crew and operational staff that make each and every flight possible. Our Air Force One, the set and show you see onstage at the Playhouse wouldn’t have been possible without the countless staff based back at MTC’s Headquarters: the set builders, prop makers, costumers, electricians and many, many more. It’s their tireless work in advance which allows us to ‘take flight’ in front of 850 people each and every night. Erik Thomson delivering the President’s opening speech during rehearsals.